HI FRIENDS ESS ARTICLE ME HUM EK AISE BUSINESS IDEAS KE BAARE ME BAAT KARENGE JO AAPKO BAHUT ACHHA PROFIT DE SAKTA HAI.JISKA NAME HAI PAPER CUP MANUFACTURING UNIT. AAJKAL HAR CITY VILLAGE ME CONSUMER JYADA SE JYADA PAPER CUP KA USE KAR RAHE HAIN.ESKE CHALTE MARKET ME PAPER CUP KI MAANG BAHUT BADH RAHI HAI.BAHAR SE EMPORT KARKE BHI MAANG PURI NAHI HO RAHI.AGAR AAP KOI NEW BUSINESS START KARNE KI SOCH RAHE HAIN.OR AAP KUCHH PAISA INVEST KARNA CHAHTE HAIN TO AAP PAPER CUP MANUFACTURING UNIT LGA SAKTE HAIN.OR PROFIT EARN KAR SAKTE HAIN. AGAR AAP 7 SE 8 LAKH RUPAY INVEST KAR SAKTE HAIN TO JARUR TRY KARE.AAPKO 200 SE 300 GAJ KI JAGAH CHAHIYE HOGI.PAPER CUP BANA KAR SELL KARNE ME PER CUP KAM SE KAM 25 SE 35 PAISE KI SAVING HOTI HAI JI SE AAP MONTHLY 1 SE 1.5 LAKH RUPAY EARN KAR SAKTE HAIN AGAR AAP DAY NIGHT DONO SHIFTO ME WORK KARTE HAIN TO. CITY KE WHOLE SALER KE ANUSAR ESS TIME CITY ME 3 LAKH CUP SALE HOTE HAIN JINME SE 70 PERCENT PAPER KE CUP SELL HO RAHE HAIN.ESKE BAAD 25 PERCENT PLASTIC KE DISPOSEL SELL HO RAHE HAIN. PAPER CUP UNIT LAGANE KE LIYE SABSE PEHLE PROJECT REPORT BNA LE.OR AGAR AAP BANK SE LOAN LENA CHAHTE HAIN TO MSME MICRO SMALL MEDIUM ENTERPRISE KI WEBSITE PAR APNE BUSINESS KO REGISTER KARVA LE.ESKE BAAD BANK ME LOAN KE LIYE APPLY KARE.PAPER CUP MANUFACTURING UNIT KE BAARE ME AAPKO INTERNET SE BHI BAHUT JANKARI MIL JAYEGI JO AAPKE LIYE BAHUT HELPFULL SABIT HOGI. 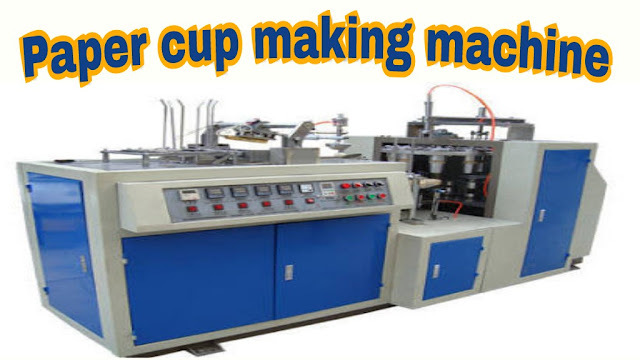 PAPER CUP BANANE KI MACHINE AAPKO HAR METRO CITY ME MILL JAYEGI JAISE DELHI GUJRAT RAJASTHAN AAGRA HYDRABAD ETC.AAP JITNE CUP BANANE KI CAPACITY WALI MACHINE CHAHTE HAIN USI HISAB SE MACHINE PURCHASE KARE JITNI AAPNE PROJECT REPORT BANAYI HAI.PAPER CUP BANANE KI MACHINE AAP ONLINE BHI PURCHASE KAR SAKTE HAIN.ONLINE BHI BAHUT SE COMPANY HAIN JO MACHINE PROVIDE KARVATI HAIN JAISE INDIA MART.YAHAN PAR AAPKO KISI BHI BUSINESS KE LIYE MACHINE MIL JAYEGI.ESI KE SAATH OR BHI BAHUT SI JANKARI AAPKO PAPER CUP UNIT KI MIL JAYEGI JAISE RAW MATERIAL KAHAN SE PURCHASE KARE MACHINE OPERATOR SE KAISE CONTACT KARE.READY KIYA HUA MATERIAL AAPKO KAHAN PAR KIS RATE ME SELL KARNA HAI.YE SAB INFORMATION AAPKO INDIA MART SE MILL JAYEGI. PAPER CUP BANANE KI MACHINE KI STARTING PRICE MARKET ME 5 SE 6 LAKH RUPAY TAK HAI.JO PER HOUR 5000 CUP BANATI HAI.AAP APNE PROJECT KE HISAB SE CHOOSE KAR SAKTE HAIN.MACHINE KE BAAD AAPKO JAGAH KI JARURAT HOGI JO AAP RENT PAR BHI LE SAKTE HAIN.OR ESKE BAAD AAPKO 2 SE 2.5 LAKH RUPAY WORKING CAPITAL KI JARURAT HOGI.